Raspberry Pi with ARM6 0.7 GHz. needs 10:30 minutes to build my version of TrueAxis. Beaglebone Black ARM7 1.0 GHz. only 2:50 minutes !?! 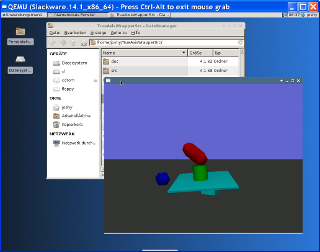 FreeBasic & TrueAxis (Mesa OpenGL) on BegleBone Black ARM7 cpu..
Last edited by D.J.Peters on Sep 25, 2017 15:58, edited 3 times in total. have you built FB for The Raspberry PI? if so, would you share? srvaldez wrote: have you built FB for The Raspberry PI? Last edited by D.J.Peters on Sep 25, 2017 15:58, edited 1 time in total. 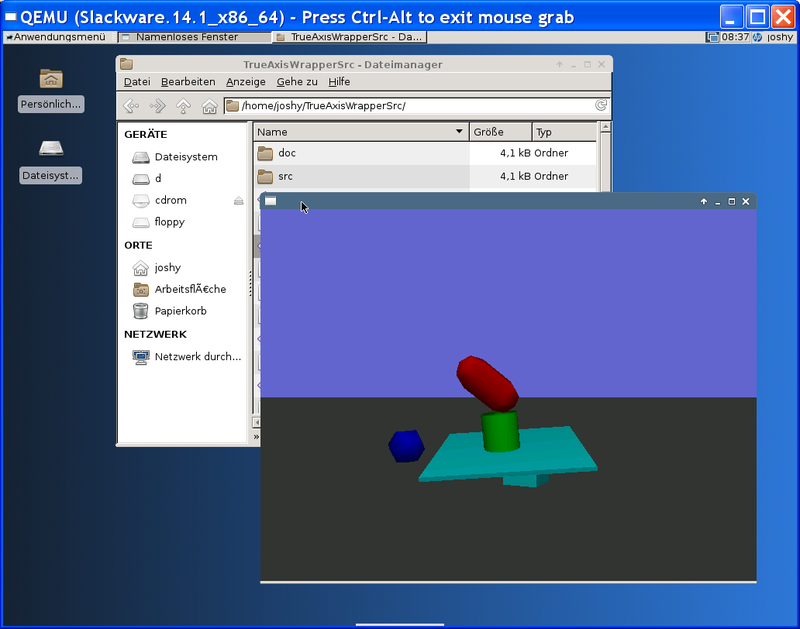 TrueAxis for 32/64-bit Windows and Linux are in the ZIP archive now. Nice wrapper! If it was for openB3D, a lot could be done with it. Is it difficult to make it work with openB3D? BasicCoder2 wrote: ... do you have anything like Dr_D has written using TrueAxis? BasicCoder2 wrote: Downloaded the TrueAxisWrapper and ran your FB examples. I assume the blue box is like the boundary around a sprite for collisions and positioning? Couldn't find a tutorial on how to use the physics engine? 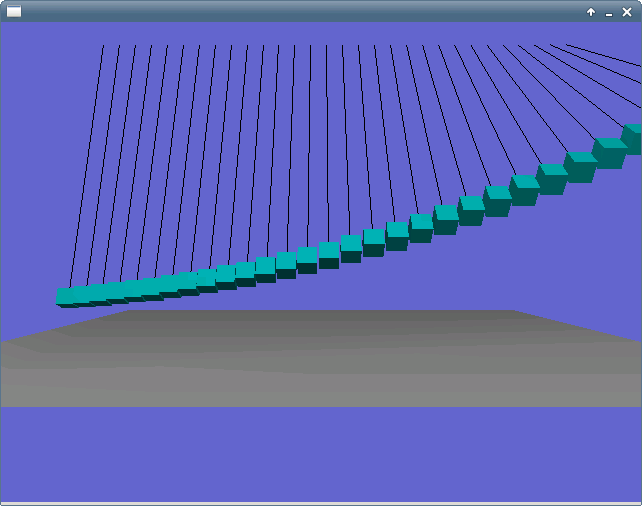 Note: it's a physics engine not a grafik engine. The primitive drawing from examples are only for DEBUG session's and learning. You have to start with the inluded *.bas files. Tip: make a copy of begin01.bas and try to add more different objects ask if you run in to trouble. I self learned TrueAxis from the include help file. It's C++ but you can find the C++ commands as FreeBASIC version in the TrueAxis.bi file. Last edited by D.J.Peters on Mar 11, 2015 5:42, edited 1 time in total. Please delete your last TrueAxisWrapper.zip download. The *.zip archive was wrong I updated the download link to the last more complete version. I double clicked the TrueAxisPhysicsSDK icon in the doc folder however only the left window with the Contents Index Search Favorites appears but nothing on the display window on the right? I am not sure how these help files work or how to open them. It just seemed to work with the FreeBasic help file and FBIde. I have started playing with your sample code, changing a few values, to get an idea how it works. It will be interesting how far I can go with it and what Dr_D can do with it. May I just say what a great contributor you have been to the FreeBasic community and you are much appreciated. BasicCoder2 wrote: I double clicked the TrueAxisPhysicsSDK icon in the doc folder however only the left window with the Contents Index Search Favorites appears but nothing on the display window on the right? It's a standard compressed windows help file. I use Windows 32-bit XP here and you ? Last edited by D.J.Peters on Mar 11, 2015 15:58, edited 1 time in total. There are over 600 commands (see at TrueAxis.bi) I self used only 5% of them. Would be good to have a documentation of all this commands. Who would like to write this. Last edited by D.J.Peters on Mar 13, 2015 20:27, edited 1 time in total. It seems that's the classic issue with downloaded help files : open properties and click on the button "unblock" (at the bottom). SARG wrote: open properties and click on the button "unblock" (at the bottom). That did it, thanks. The thought of reading through all those commands is already giving me a headache. It is much nicer to have a tutorial that introduces them as required for each project. I notice the file is old. Copyright (C) 2004 - 2006 True Axis Pty Ltd, Australia. My laptop uses Windows 7. D.J.Peters wrote: Who would like to write this. True Axis FreeBASIC Wrapper documentation first version isn't perfect nor complete but hey it's a good starting point. Last edited by D.J.Peters on Mar 15, 2015 22:27, edited 1 time in total.